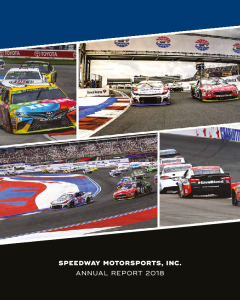 Speedway Motorsports, Inc. (SMI) is a leading marketer, promoter and sponsor of motorsports activities in the United States. The Company, through its subsidiaries, owns and operates eight first-class racing facilities in significant markets across the country. The Company also provides souvenir merchandising services, and food, beverage and hospitality catering services through its SMI Properties subsidiaries; manufactures and distributes smaller-scale, modified racing cars and parts through its U.S. Legend Cars International subsidiary; provides radio programming, production and distribution through its Performance Racing Network subsidiary.